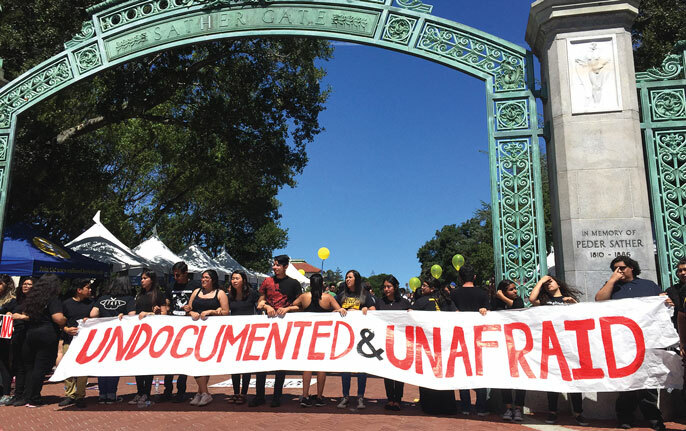 Campuses are marshaling legal, emotional and moral support for the undocumented UC community. If your DACA permit expires between September 5, 2017 and March 5, 2018 you can apply for a renewal but you must do so before October 5, 2017. Limited funds are available to cover the $495 renewal cost and are being offered on a first-come, first-served basis from the Mission Asset Fund. http://lc4daca.org/. In the hours following the Trump Administration’s announcement that it would end the Deferred Action for Childhood Arrivals (DACA) program, an emotional crowd packed onto couches and chairs in UCLA’s recently opened undocumented student services center. Students shared immediate and practical concerns: Were they at risk of being deported to a country they had little or no memory of? Would they lose the ability to do work-study or hold side jobs they needed to pay for college? Would they be able to work legally after graduation? University administrators, including immigration experts and mental health counselors, were there, too, to help students understand the immediate impact of the ruling, and to reassure them that UC would continue to be a safe, supportive place. Similar scenes have been playing out across UC’s 10 campuses in recent days. The decision to rescind DACA’s protections is estimated to affect several thousand UC students, as well as an unknown number of staff and alumni. A banner unfurls at Sproul Hall on the UC Berkeley campus in response to actions related to undocumented immigration. As students took to the streets to protest or gathered quietly in student lounges to share their fears and emotions, organizations across the UC system mobilized to provide students with quick access to timely information — as well as the emotional and practical support to help them cope. They were aided by resources, from undocumented student centers on every campus to legal assistance, established across the UC system as part of an initiative launched by UC President Janet Napolitano in 2013 that provides broad-based services to UC’s undocumented community. In a year marked by policy upheavals and increasingly heated anti-immigrant rhetoric, these programs have proven to be a lifeline for affected students and their families. The decision to rescind DACA “was a moment of intense grief for our students and a painful reminder of America’s unfulfilled promise to our community,” said Meng So, director of UC Berkeley’s Undocumented Student Program, which held a closed-door meeting to help students process the news. Drop-in counseling services offered through the program spiked 350 percent that week. At the UC Immigrant Legal Services Center, which provides free legal assistance to students across UC campuses, phones were ringing off the hook with panicked calls from students whose lives had suddenly been pitched into uncertainty. “As soon as the announcement was made, we got all our lawyers on the phone and tried to understand what it meant,” said Maria Blanco, director of the center. Established in 2015, it extends legal assistance to students on every campus except UC Berkeley, which offers its own such services. Within hours, a letter providing practical, immediate legal guidance had been circulated across the university system to those charged with providing resources for UC’s undocumented population. “We quickly realized that Oct. 5 would be a critical cut-off date,” Blanco said. DACA recipients with permits that expire between Sept. 5 and March 5, 2018 have until Oct. 5 to apply for renewals, which will be valid for their full two-year term. In a letter to the entire UC community, Napolitano and the 10 chancellors urged DACA permit holders not to delay in filing for a permit renewal. “Applying for a renewal no later than October 5, 2017 is the best opportunity to obtain two more years of protection against deportation and have legal authorization to work,” they wrote. Grants from a Bay Area nonprofit and other non-state sources, are available that can help cover the $495 application filing fee. UC officials have been reaching out directly to affected students to let them know about those funds and encouraging them to act quickly. Rally attendees express support for the undocumented on the UC Berkeley campus in January 2017. Officials are seeking to reassure students that their financial aid won’t be cut. And they are working to find alternative funding sources for work-study, which currently rely upon the protections afforded by DACA. The campus DREAM center has been helping students with the paperwork to reapply for DACA, and will host a series of workshops, ranging from how the deportation process works to how entrepreneurism can offer an avenue to participation in the formal economy. Centers like UC Davis' AB540 and Undocumented Student Center, pictured above, have opened on most UC campuses to provide services and foster community. While the decision to rescind DACA is the latest crisis, it is far from the only issue undocumented students face. On some campuses, as many as one in five UC students are not eligible for DACA protections — and virtually all have family members who aren’t shielded by its protections. Through the undocumented student initiative, UC has provided systemwide resources to students regardless of whether or not they are DACA eligible. UC has established undocumented student programs on every one of its 10 campuses — and most have places where students can gather to share issues and concerns in a setting that cuts across ethnicities and nationalities. “One of the most effective things we can do for our students is provide them with a physical space to connect with others who share their experiences,” said UC Irvine’s Teran. The campus is opening the doors on its brand new Dream Center just as students arrive this fall. It includes workshop space, a lounge area and student service offices. Centers like these across UC campuses serve as a one-stop shop for finding emergency loans, connecting with peer mentors, forming study groups and accessing textbook lending libraries. Beyond those kinds of services, the president’s undocumented student initiative has also expanded academic opportunities — such as graduate school and summer research — from which students without legal status have historically been excluded. And it has created a path that makes it easier for undocumented high school and community college students to attend UC. “I got to see that someone like me, from an underserved neighborhood, who was low-income, Latino and undocumented, was capable of going to a school like UCLA,” said Compton resident Julio Reyes Cabezas. While an El Camino Community College student, he stayed at the campus as part of a summer bridge program aimed at undocumented students. He is now completing a psychology degree and is a representative of Improving Dreams, Equality, Access and Success (IDEAS), a student-led organization advocating for the campus undocumented community. Meng L. So, second from left, director of the UC Berkeley Undocumented Student Program, is working with his team to meet exceptional demand for services on campus. Now, with the shift in immigration policy and rhetoric under the new administration, UC’s undocumented student services are seeing a level of demand that few anticipated when the programs were created. “We’ve seen a skyrocketing increase in foot traffic since Trump took office, especially in terms of demand for mental health services,” said So. He reports that the number of students seeking service from the counseling center has almost doubled over last year. The emotional toll of such chronic threats to basic security, both via physical safety and employment safety, he said, can cause tremendous distress. The UC Immigrant Legal Services Center, based in the law school's King Hall pictured here, opened in November 2014, serving the six campuses that do not have their own law schools: Merced, Riverside, San Diego, San Francisco, Santa Barbara and Santa Cruz. The chief architect of the DACA program while serving as secretary of homeland security for the Obama administration, Napolitano and the University of California became one of the first to sue the current administration in order to challenge its decision to rescind it. The university is also working to get bipartisan support for a legislative solution that would provide permanent protections to DACA recipients. In the immediate term, UC legal clinics have stepped up to help students and their families address individual concerns — in some cases garnering more permanent protections. The UC Immigrant Legal Services Center has served 1,100 clients this year, compared to 300 the year before. The chief architect of the DACA program while secretary of homeland security under the Obama administration, University of California President Janet Napolitano is now in the position of defending it on behalf of the UC community. The center has moved quickly to help affected individuals make sense of sudden and murky legal rulings, such as the Trump administration’s ban earlier this year on travel from several Muslim-majority countries. It has held dozens of “Know Your Rights” workshops. Attorneys have been able to help secure bonds for family members picked up by U.S. Immigration and Customs Enforcement (ICE) so they don’t languish in detention, said Blanco. And they have helped roughly 30 percent of their clients find a permanent path to legal residency by identifying those who qualify for lesser-known legal protections, such as asylum and U-visas, designed to protect crime victims. Along with helping UC students, the programs are proving to be a model for other colleges and universities grappling with changes in immigration policy and potential impacts to their students. UC Berkeley, which hosts an online portal to help other institutions of higher education launch similar programs for undocumented students, has consulted with 240 colleges and universities — 74 of them since Trump took office. Even in the current climate, advocates are pushing forward with efforts to make the university more welcoming and to expand academic opportunities for these vulnerable students. This fall, in part through student advocacy efforts, UCLA is opening a low-cost housing option aimed at helping marginalized populations, including the undocumented, be better able to live on campus, avoiding long and potentially costly commutes. The university is one of the first in the nation to have launched an Undocumented Alumni Association, providing an avenue for current students to network with recent graduates. UC has seen an increasing number of undocumented students pursue and complete Ph.D.s, and will soon celebrate its first students to complete medical and law degrees. These developments give many students a reason to be hopeful, even amid a climate of fear and uncertainty. “These institutions weren’t built for students like us, but efforts like these help to make them more welcoming,” said Reyes Cabezas.